Nearly 14 percent of children have one or more special needs ranging from autism to cerebral palsy. These kids often have troubles socializing and even playing, which is why it’s important to address various abilities on the playground. Additionally, we’re seeing an increased number of caregivers who are injured military service members and part of an aging population. Their needs are also important to consider so that entire families can come to the playground for fun and recreation. The above reasons are why we’ve expanded our inclusive play product offerings. The new We-saw™ is a seesaw that was specifically designed to accommodate people of all abilities. It is a multi-person seesaw that is accessible, promotes social inclusion and offers a multi-generational solution. The We-saw provides a truly inclusive play experience by accommodates multiple users, and the We-saw’s walk-in seating allows for easy access and transfer for those with mobility issues. Everyone that climbs aboard the We-saw will experience a fun, user-controlled ride. We are committed to providing play experiences for children of all abilities. 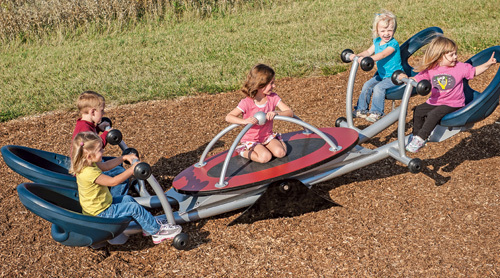 With our design philosophy, which addresses the environment, the play experience and variability, and other inclusive play product innovations like the OmniSpin® spinner and Oodle® Swing, we bring children with and without disabilities together to play, learn and grow on the playground. This entry was posted in autism, Inclusive Play, Inclusive playgrounds, Play, special needs and tagged design philosophy, military service members, multi-generational, product innovations, social inclusion, wounded warriors by PlayLSI. Bookmark the permalink.